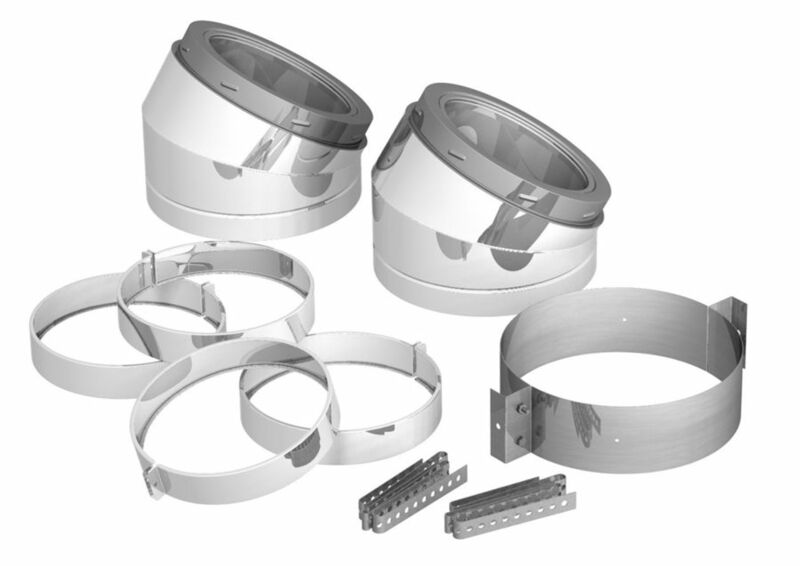 The insulated elbow is used when offset is required. Locking bands must be used on all elbows. A maximum of 6 feet is allowable between offsets. 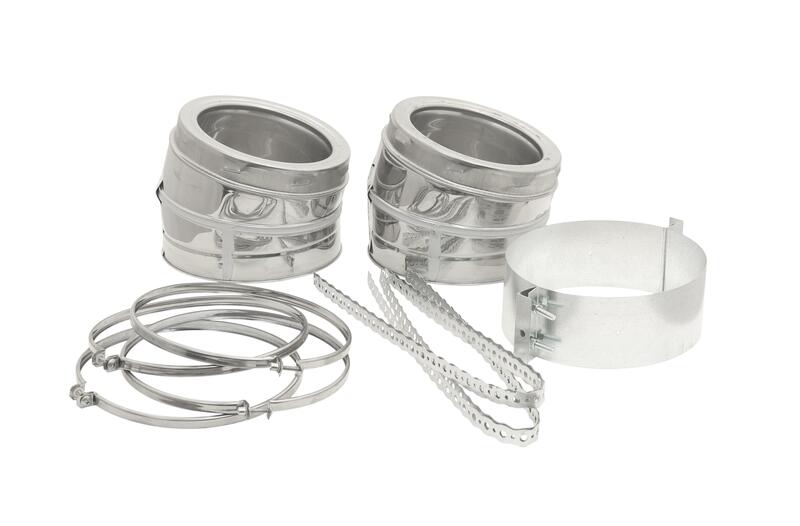 Elbow is fully insulated and can be used with the same 2-inch clearance as chimney lengths. Elbow support must be used with all offset installations and will support 15 feet of chimney. Elbows do not have twist-locking ridges, so they can be rotated to attain optimum positioning offset and allow chimney to return to correct vertical alignment prior to installing locking bands. May not be used outdoors. * 10"-14" 15° elbows B dimension is total height. It may be necessary to offset the chimney in order to clear a joist or an obstacle. The two (2) charts on the following page will assist you in selecting the proper combination of elbow angle and chimney length(s) that will provide the necessary degree of offset within an available height. Select the column with the proper chimney diameter of your system. Determine the distance of the offset required by dropping a plumb line for an accurate measurement. 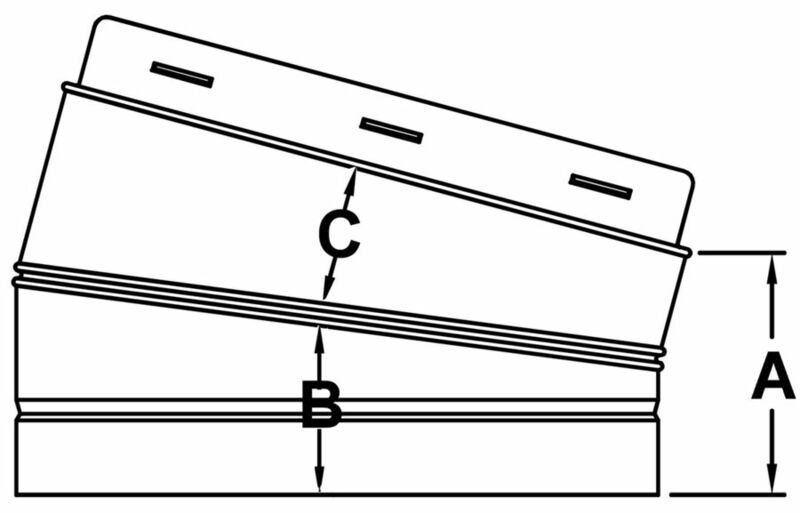 The offset is measured at the chimney centerline, as per the "A" Offset measurement in the diagram below. On the chart, find the predetermined distance (under the "A" column) required for the 15° elbow. For greater offset, use the 30° offset chart. After finding the offset, look at the "b" (height) measurement in the chart to find the specified height. The appropriate "chimney lengths" required in between elbows is found in the left- hand side column of each chart. 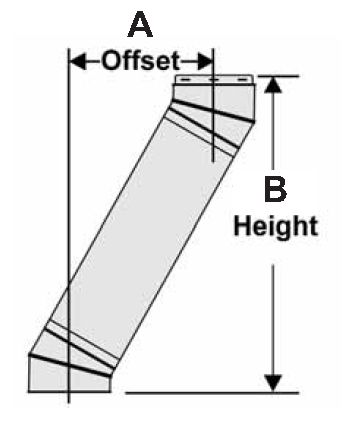 Model TLC chimneys are limited to offsets not exceeding 30°. Combining offsets for greater angle is not permitted. One pair of (two) elbows may be used for interior installation only. Never install an elbow in a joist area. Chimney sections must pass vertically through framed joist areas. Locking Bands must be used at all chimney joints. Each elbow resupport will support 15 feet of chimney. The maximum length of chimney allowed between elbows is 6 feet.